public schools (I AA 1). (exhibit 44) (IV AA 748). (V AA 1021) (exhibit 60). TO STRIKE (VII AA 1460). in this appeal(XI AA 2569). April 5, 2013 (XI AA 2676). v. Henness (1959) 172 Cal. Forest (1997) and Evans v.
from mentioning the name of Plaintiff, was unconstitutional. Plaintiff—circumventing and ignoring the decision of the Court of Appeal. the court’s attention have been deemed violations of the injunction. intends to give permission to Defendant to say anything at all about Plaintiff. in a timely manner in 2007, and was adjudicated in 2009.
default judgment, as well as other decisions made over the past six years. the constitutionality of the April 2009 injunction. Village Inn, Inc. v. Lemen and Evans v. Evans. a jury to be defamatory. a jury trial for damages. fraud as well as several other reasons that are detailed in this brief. outcome that requires that the summary adjudication be set aside. injunction is unconstitutional and an abuse of discretion. abused its discretion in refusing to dissolve the injunction. invalidated because it was achieved by fraud. F. Alternatively, Appellant is entitled to a jury trial for damages. was granted as to all causes of action. extrinsic fraud on April 6, 2009.
deprive Defendant of a jury trial for damages. THE WITNESS: Okay. That’s the end of this deposition. MS. LARKINS: Are you going to attend your deposition, Mr. Shinoff?  guidance for both parties in terms of the rules that govern the deposition process. deposition Dan Shinoff refused to attend. witness at a jury trial for damages. answer questions (I AA 118). provide the evidence it had. stamped documents that Plaintiff failed to produce. 2693-2741). There is no evidence that Plaintiff ever looked at the disks. that she should not be allowed to present them at trial. other issues that aren’t contained within there. that they were made without intent to damage or without reckless disregard, right? re-litigating why they’re true, I think they’re true, she already had that chance. decided as a matter of law, no they’re not true. defense for malice, what does that consist of? the matter be relevant to that determination? agreement did not work out. 5. Plaintiff opposed Defendant’s requests for jury trial for damages. cover up wrongdoing as Plaintiff and the court have argued. to allow her to say anything at all about Plaintiff. between the parties: Defendant would be free to report any and all facts. nodded in agreement. During my hours of discussion on April 6, 2009 with Mr.
behavior” or “intimidation”. No other accusation is forbidden by the injunction. Rights…” (XI AA 2590 lines 7-15). h. Plaintiff’s representatives James Holtz and Jeffrey Wade, Jr.
publish any information at all about Plaintiff. decree, and open the case for a new and a fair hearing.” United States v.
Throckmorton (1878) 98 U.S. 61, 65-66. "The seminal definition of extrinsic fraud is found in United States v.
convincing the other party to refrain from presenting a claim or defense. 1. The default and injunction in this case are miscarriages of justice. adjudication, which makes the striking of the Answer completely moot! own position and is refusing to produce evidence helpful to Defendant. throw this case out (II AA 361). through extrinsic fraud or mistake. 6. No litigation privilege exists for extrinsic fraud. Enforce, the injunction was intentionally misstated and misinterpreted. written agreements in the past, for example, Vista Unified v. Dr. B.J. Dr. Freeman had agreed to testify under oath as the District wanted! that Plaintiff or its attorneys ever had committed or ever would commit. that its actions were unethical. on behalf of public schools and other public entities. trial, right to free speech to Defendant. 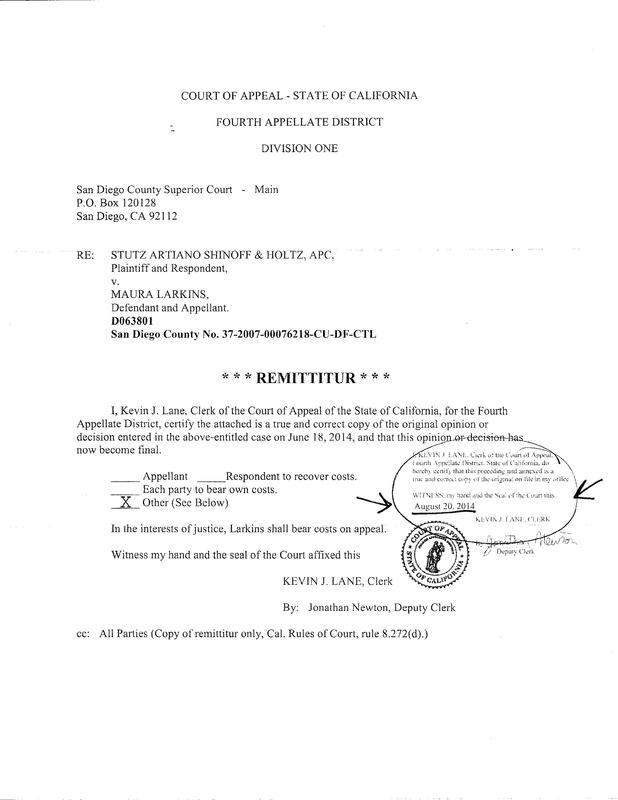 Bate-stamped documents related to statements on Defendant’s website. to agree to an unconstitutional injunction. who willingly signed away her First Amendment rights. relinquish, and which the court had no jurisdiction to take from her. THE UNITED STATES CAN MAKE ANY KIND OF AGREEMENT THEY WANT. Farahani case did not involve deceit or fraud. insisted she was not giving up. M. This injunction was not obtained through due process. opposition, and relying on Plaintiff’s declarations. would not express four specific opinions. though Defendant pointed out that it hadn’t been in the complaint. The Court: Let me read it again. What’s the matter with “intimidation”? Ms. Larkins: I don’t believe that was in the complaint. I don’t think it was litigated. The Court: Okay. Is that something you have a serious disagreement with? The Court: You’re not going to put any language accusing them of intimidation? Ms. Larkins: I just thought—you could add a lot of words. The Court: That’s right, but pick your battles. Is that one you want to fight? petition for redress of grievances. deceptive URL and had profited from his website. Plaintiff produced no transcript of any deposition for Mr.
promised on April 6, 2009. Defendant has been slapped with sanctions and a default. a jury trial, including her Motion for Jury Trial (V AA 1141). THE TRIAL. I MAY DO ANY OF THOSE THINGS. trial court has allowed it. accusation of illegal, unethical intimidating or incompetent behavior. unethical, intimidating or incompetent actions before she publishes it. attorneys” is a statement about an unethical action! Defendant scheduled an ex-parte hearing on June 27, 2012 (VII AA 1513). the hearing until July 27, 2012. TRAINS SCHOOL ATTORNEYS IS A VIOLATION OF THE INJUNCTION? OF YOUR PLAN TO CIRCUMVENT THE COURT ORDER. BE. SO I'M NOT GIVING YOU PERMISSION TO PUT ANYTHING ON. the Motion to Strike (exhibits 95b, 95c) was “a violation” (3 RT 170, 17-21). states that trial by jury is an inviolate right and shall be secured to all. FIRM, AND I THINK THAT'S THE COMPLAINT THAT THE LAW FIRM HAS. over a year before Judge Hayes’ “finding”. The injunction would prohibit Appellant from mentioning that Ms. Defendant to present any evidence, so a jury trial was out of the question. obviously illegal punitive damages, in addition to $8,400 in sanctions. narrowest manner, not the broadest manner, possible. of the injunction as to "where the limit is." unenforceable because it violates the constitution. records, thus abusing her discretion. injunction, in violation of the Communications Act. presented evidence of recently discovered wrongful actions by Mr.
petition for redress of grievances and equal protection of the law. attorneys. Defendant is not allowed to seek legal representation. although he is financially liable for the sanctions and judgment. (actually, public records and third-party comments) had been erased. allowed to publish information about this case? (vol. 3 RT 163 lines 2-5). RT 165, 26-28 to 166 1). understood that, and you did. I make that finding (3 RT 168, 7-9). political reporting that does not even express an opinion. exactly what statements violated the injunction” (3 RT 168, 17-21). and filed and extremely brief minute order for July 27, 2012 (IX AA 2033). been given proper notice of the injunction. 130 Cal. App. 3d 398, 404-405, 181 Cal. Rptr. 703]. B. The April 6, 2009 injunction appears to be narrower than the Dec.
Amendment as well as Article I, Section 2 of the California Constitution. before it has been determined at trial that the statement was defamatory. Evans, so too is the trial court’s injunction here equally impermissible. dissolution is sanctioned under Code. Civ. Proc. Sec. 533.
actions in the instant case seems to be unprecedented. interest..., as is the Defendant in the instant case. C. A court-sanctioned settlement precludes a default. damages that day" (emphasis added). the jury trial for damages. summary adjudication is in force. would draw from looking at the record. and judge have quoted in this proceeding. consists of the same graph repeated fifteen times. 2515, they can not be assumed to have been made by multiple searchers. It was unreasonable for the trial court to order Defendant to pay Plaintiff $. 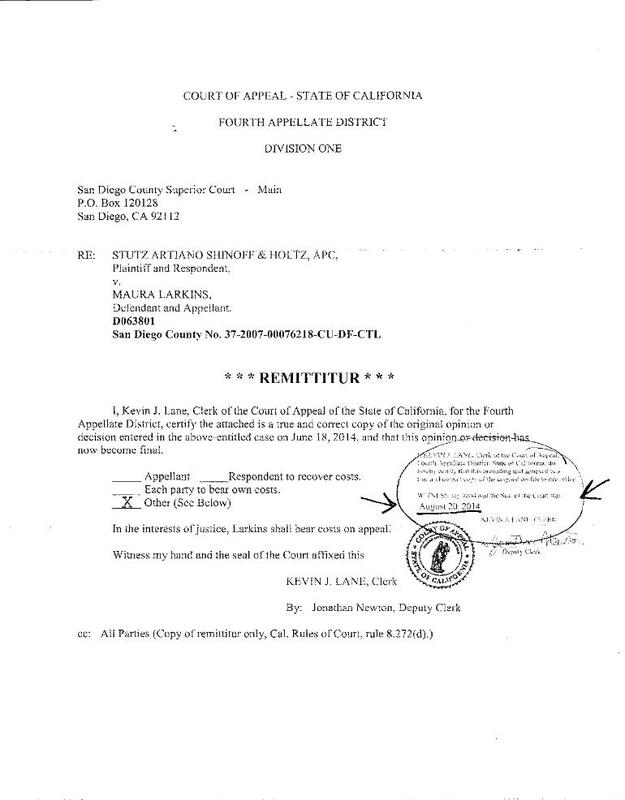 schools, education and San Diego politics; or non-Plaintiff lawyers. unconstitutional and abuses of discretion. since the injunction is unconstitutional, the default must be reversed. be imposed upon the profits of the Stutz Firm by Ms. Larkins’ blog. American prior restraint jurisprudence and vacate the injunction below. 2. Defendant requests that the court set aside default judgment. adjudication and conduct a trial on all issues. continue its oversight of the injunction. program used to prepare the brief. actions in a specific way. agreements of April 6, 2009.
injunction on April 6, 2009.
through fraud is null and void. exceed the bounds of reason. money to Stutz law firm. not at issue any longer. case relied on Del Junco v.
Balboa Island Village Inn, Inc. v.
40 Cal.4th 1141 , 57 Cal.Rptr. Evans v. Evans (2008) 162 Cal. 1157, 1171-1173, 76 Cal. Rptr. Gomez (a996) 46 Cal. App. 1674, 1678 n.1, 54 Cal. Rptr. Henness (1959) 172 Cal. App. Sporn v. Home Depot USA, Inc.